Cattle feed company 4 Seasons Molasses approached Skellerup Rotomould to develop and manufacture their concept for a new molasses dispenser. Molasses is used to supplement the diet of cattle to improve digestion and as an additional source of nutrients. Intake needs to be regulated to prevent over-consumption, which is mechanically limited by the amount the animal can lick off the wheels before their tongue gets tired. The creative shape required for the mould was difficult to produce using the 2D drawing facilities available at Skellerup, so Motovated Design & Analysis Ltd was invited to contribute its 3D Computer Aided Design (CAD) capability to help solve the design issues involved. This proved to be a very successful decision. Working from a plywood prototype a number of concepts were presented, including internal and external ribs to add stiffness, and a curved top. The 3D nature of the modelling provided for easy visualisation and quick modification. 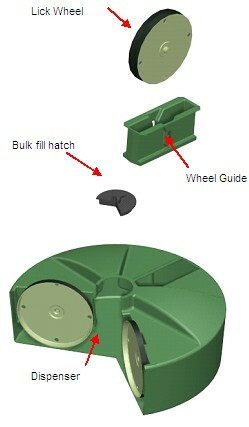 A novel "click-in" wheel guide design was chosen to avoid the need for a complicated pin assembly, and allowed the product to be produced predominately using rotomoulding. The final product was a 550 litre capacity, easily moulded design weighing just 40 kg when empty. Motovated produced manufacturing drawings for the moulds, with an expansion factor added to accommodate for shrinkage of the parts on cooling. 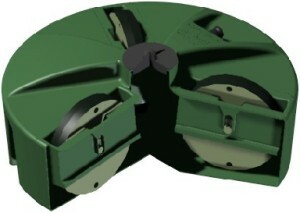 Information was provided for removing flashing and assembly of the dispenser, and marketing brochures were created using a fully rendered 3D model. ⟵Tips & Tricks – Re-entrant corners!